Choose from TONS of games – A good variety of more than 700. Many games are compatible with most mobile devices. They process withdrawals fast – as quick as 2 hours. Get a different bonus on each of your first few deposits. Play live dealer casino games from the comfort of your own home. Guts Casino and Sportsbook is truly a one of a kind experience for punters. 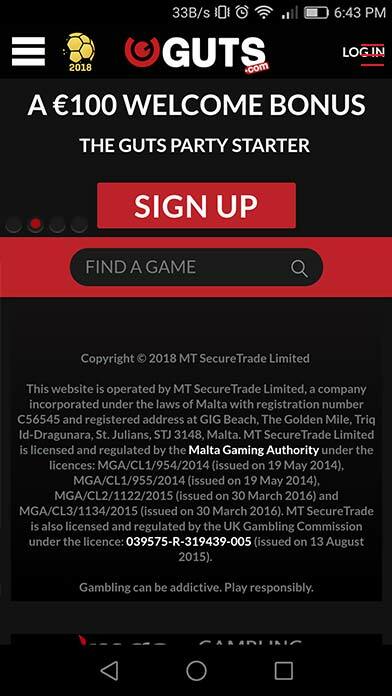 The Malta-based company launched in 2013 as a division of MT SecureTrade Limited – owned by Gaming Innovation Group (GiG). The site features three gambling licenses and is open to most countries – but not the United States. On every level, this site is impressive. When you first visit Guts.com, you are greeted by a professional design that screams fun. All games are available for online play. Guts uses its proprietary iGaming Cloud Network (created by GiG) to bring the top games from five different developers right to your fingertips with an easy to use interface and large game library. For the sportsbook, they offer bets on everything from ice hockey to snooker to Gaelic football. We had a lot of fun testing out this site and generated this comprehensive review based on our experience. Guts was launched in 2013 by a group of experienced iGaming professionals, with a clear aim of making a difference to the online gaming industry. In many areas, they've done exactly that. From a playing point of view, Guts is an excellent, modern-looking casino, designed for a new generation of players who want to choose how and when they play. The site is extremely user-friendly and designed to remove all unnecessary hassles. The selection of games is vast, and using multiple software providers means Guts can - and will - always offer the best choice available. But it's in the other, less glamorous, areas where Guts really stands out. Banking designed to address players' concerns over limited deposit options and ridiculously slow payouts; Genuine 24/7 support with live, knowledgeable and courteous staff; Transparent company and licensing details, so players know they're spending their time and money with a reputable outfit. In each of those areas, Guts scores highly. As is usually the case, payment methods may be unavailable to players who reside in given countries. That is why, it would be best to log into your casino account to first check which methods are available to you and then, select the one which covers your personal requirements. Some of the most popular methods to deposit funds into your Guts account include credit or debit cards by Visa and Mastercard, prepaid vouchers by PaySafeCard as well as Euteller, Trustly and e-wallets by Skrill and Neteller. Support at Guts Casino is provided via live chat that is genuinely available 24 hours per day, 7 days per week. There is no phone number published on the site but you can fill out a form with your phone number and support will call you, which saves you money on your phone bill. If you prefer to use email support, you can expect an answer within a few hours. I tested the live chat support when compiling this review and had a support rep addressing my question within a minute. Overall I was as impressed with the support at Guts as I was by the quick withdrawals. The Guts standard Welcome Bonus is 100% up to £100 and 25 complimentary spins on deposit. This bonus has a wagering requirement of 35xbonus for the deposit bonus and complimentary spins do not carry a wagering requirement. This bonus uses the standard bonus structure where bonus terms apply from the moment of deposit and withdrawals can be made only after the wagering requirement has been met. The maximum allowed bet is £6 on any single round of play. Great post. I was checking continuously this blog and I am impressed! Very useful information specially the last part 🙂 I care for such info a lot. I was looking for this certain info for a very long time. Thank you and best of luck.